There’s a granite peak just west of Strathbogie, between Strathbogie township and Mt Wombat. It’s not a high peak or otherwise distinctive, but like many passers-by, I’ve often looked at it and wondered- what is it? how can I get there? what’s up there? So, on Saturday July 7, forecast to be a blue sky day after a frosty night, ten of us spent several hours exploring Mt Spy. In fact, Mt Spy is comprised of two separate Bushland Reserves and some bits of remnant vegetation on private property that together form this rocky island of native vegetation. 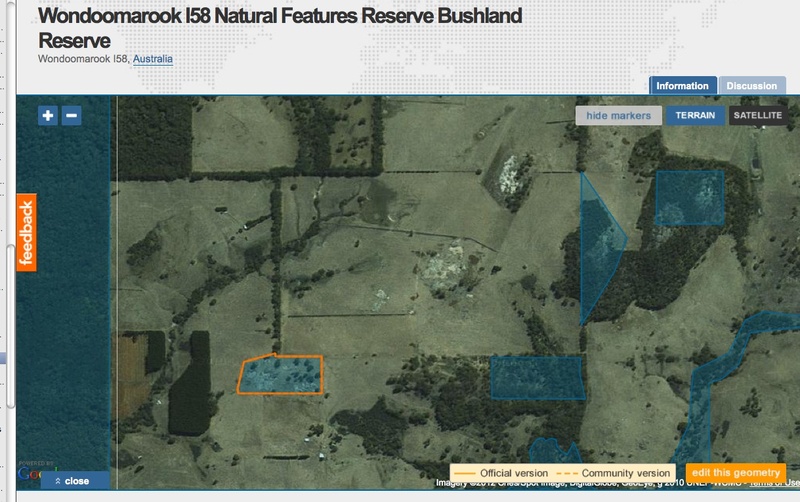 There are several parcels of public land, all Bushland Reserves (though one is leased for grazing), in this area (you can have a closer look by going to the Protected Planet website) and they constitute an important biodiversity asset that links the important Seven Creeks corridor to other native vegetation in the landscape. 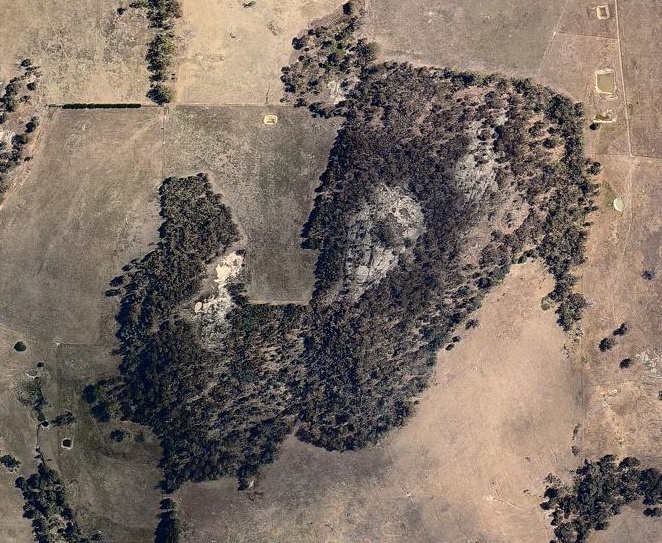 Mt Spy was pretty thoroughly burnt in the 1990 bushfires and plenty of evidence is still visible, particularly the dense post-fire regrowth of eucalypts (mainly Blue Gum, Red Stringybark and Broad-leaf Peppermint) and some still-blackened tree trunks. Whilst the northern and western sections are fenced, sheep for neighbouring farms have access to all parts of Mt Spy and they clearly spend quite a bit of time up there. Many of the flat, rocky areas are fouled by accumulated sheep dung and much of the site’s shrub layer and ground layer vegetation is suffering from serious overgrazing/browsing, mainly by sheep. Nonetheless, there are still some nice pockets of bush and lovely views of the Strathbogie Tableland. With a bit more TLC and a few fences this area could recover to be a beautiful spot overlooking ‘Bogie and the Seven Creeks. Perhaps the local community can work with neighbouring landholders to improve the quality of the bush on Mt Spy. During our walk we saw only a fraction of the area, so it’ll definitely be worth a return visit, perhaps during late winter-spring when many of the plants will be in flower. Birds: Eleven species of bird were recorded; Yellow-tailed Thornbill, Flame Robin, Aust. Magpie, Pied Currawong, Raven species, Crimson Rosella, Welcome Swallow, Grey Shrikethrush, White-throated Tree-creeper, Wedgetail Eagle, Sulphur-crested Cockatoo. Mammals: Six mammal species were recorded; Koala, Eastern Grey Kangaroo, Swamp Wallaby, Sheep, Rabbit, Wombat. No reptiles or frogs were recorded. Plants: A total of 64 species of plant were recorded on the day. A full list of plant species can be found on this link. Important: The only access to these reserves is through private property, or along unused roads, so be sure to check with neighbouring farms before you go for a walk. Here are some pics of our walk. Heading for Mt Spy, followed by a heard of locals. Heading straight for the top. Toxic Rock Isotome (Isotome axillaris)- also grazed by sheep. Lots of sheep dung and everything nibbled down to ground level. A close-up of Strathbogie township. One of the last, severley browsed, Flat-leaf Bush-pea (Pultenaea platyphylla), a rare species in the Strathbogies. Red Stringybarks (E. macrorhyncha) being ringbarcked- sheep or roos? View towards Mt Strathbogie in the distance. Fern-leaf Hop-bush (Dodonaea boroniifolia) surviving among rocks, where sheep can’t reach. Next Next post: Mt Spy aka Major’s Hill.